Chef Stephen Durfee is a Professor of Chocolate and Pastry Arts at the Culinary Institute of America, Greystone, in Napa Valley, CA, where he oversees the Bachelor’s Concentration: Advanced Concepts in Baking and Pastry. Formerly the Executive Pastry Chef of The French Laundry in Yountville, CA, he won the 1998 James Beard Foundation’s Award for “Pastry Chef of the Year” and was named one of the “10 Best Pastry Chefs in America” in 1999 by Pastry Art & Design and Chocolatier magazines. Chef Durfee’s recipes regularly appear in cook books and magazines and he has written numerous articles for Baking and Pastry magazine. His six-part video series, “The Everyday Gourmet: Baking Pastries and Desserts”, was commissioned by The Teaching Company and featured in their series, “The Great Courses”. 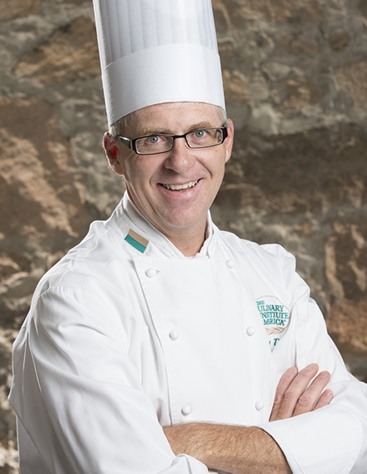 Chef Durfee has participated in multiple individual and team pastry competitions and has earned top honors in dessert tastings and chocolate centerpieces. He was awarded a bronze medal in the 2007 National Pastry Team Championships and a bronze medal for the 2010 World Chocolate Masters National Selection. In 2012, he was selected to join “Pastry Team USA”, to compete in the prestigious Coupe de Monde de la Patisserie in Lyon, France. As Chocolatier and Plated Dessert specialist, he helped guide the team to a fourth place finish in the 2013 Pastry World Championships.